"My ventures are not in one bottom trusted, Nor to one place; nor is my whole estate upon the fortune of this present year: Therefore, my merchandise makes me not sad." "I puts it all away. Some here, Some there, None too much anywheres, by reason of suspicion." "A calm and modest life brings more happiness than the pursuit of success combined with constant restlessness"
DATABASE accuracy LONGEVITY-- Years of research, modeling, analysis, multi-mainframe computer power, and a pristine data base of more than 100,000 world stock and futures markets reaching back up to 50 years has made CSI the natural choice as a market support tool for identifying spread trading opportunities. Typical spreads involve fundamentally related (correlated) pairs of stocks w/ stocks, futures w/ futures, and stocks against futures. CSI is the premier error free choice among Google, Yahoo! and Microsoft Network so most already know of our reputation as the most error-free data supplier in the market data business. Pair trading is a form of spread trading whereby trading correlated markets in pairs, traders can harness natural fundamental forces which tend to bring related markets together and benefit from the experience. Database scope-- CSI's Correlation analysis studies hundreds of millions of market pairs each day, and computes the level of correlation between such pairs over periods of daily information that range from two years to 30 years into the past. We suggest using a default of 20 years of daily summary price information. This massive daily computing effort is completed minutes after world markets close daily. Customers can search for trading opportunities between any proposed pair of markets, any market against all other world markets, or all markets against all other markets, and uncover the merits of trading any one or more of the resulting billions of pairs for each and every time period chosen. Dollar denominated--	The CSI database involves many international markets, but in all cases where the non-U.S. markets are examined and compared, all non-US market prices are converted to U.S. Dollars using the latest currency conversion quotations maintaining a U.S. dollar common denominator for all calculations. In the case of forward-delivery commodity futures products, a consistent three month forward delivery algorithm is used: namely CSI's trademarked Perpetual Contract® computation. Please read the online manual for CSI's Unfair Advantage® (UA) product which offers a depth of additional tools & innovative studies for traders. The unique market symbols used by CSI assist in identifying opportunities found in the Market Data Specifications section on the CSI website. All historical charts are drawn from daily summary data in the CSI database. Unique symbols employed agree with sponsoring exchange rules and conventions. Searching efforts are explored via stock and futures exchange symbols, product or company names, or CSI's proprietary numbering system. When applying CSI studies, enter the accepted market symbol to be analyzed or use a portion of the market name when a symbol is unknown. If an exact symbol match cannot be found, users may make selections from a table of suggested alternatives. Logging in-- Once you are at CSI's website, click "View Reports" at the top of the page. If you are a first time user, click "Login" and provide your UserID and password that you obtained from CSI customer support. Call (800)274-4727 or (561)392-8663 if you have not yet sign up. Menu preferences-- Familiarize yourself with CSI's various menu and comprehensive search options such as Pricing / FAQ / Stock Picks / One vs. One / One vs. All / Portfolio / All vs. All / and Preferences. A quick familiarization effort will save you time in the exciting pursuit of correlation-based trading opportunities. Something we often fail to mention is that each new day the group of yesterday opportunites will be dropped from the extensive "All" studies list, and new opportunities and profitable challenges that materialized from natural overnight business conditions are identified. This is one of the dynamic properties of the correlation effort involving billions of market pairs. If you failed to act on an opportunity today, uniquely different situations are likely to materialize tomorrow, so missing an occasionally day will not hurt your prospects for future profits. The approach-- CSI adopts a proprietary and comprehensive statistical process which measures the opportunity for profitable gain by selling short a statistically overpriced correlated market against the simultaneous purchase of the correlated counterpart market. This process occurs every new trading day based upon the statistical positioning of each member of the market pair on the day the study is conducted. It is up to the using customer to identify the future moment when it is appropriate to capture profits, or cut losses when correlation strength is insufficient to push the market pair toward expected profits. A couple of fully disclosed statistical factors assist the trader on the appropriate moment to act. One is the level of correlation in effect on the day when a decision to launch a pair trade is appropriate; the other is the computed statistical disparity (the measured statistical profit opportunity) between the members of every market pair. Searching for winners-- Upon signing onto the CSI system, a search of the correlation opportunities for today's opportunities can be easily launched. For example a starting point might be to simply run a comprehensive study to explore the markets most heavily correlated such that those particular markets are sufficiently separated on a temporary basis to be considered as opportunities for profit. The inputs for such a global search would depend upon whether you want to explore stocks, futures, or both, the range of correlation probability levels you are willing to consider, and the final trading day's statistical separation level in standard deviation (or Z-score) units. Each request will result in up to hundreds of opportunities for you to consider. If you choose inputs carefully, you will likely see outstanding opportunities for profit. Once your output appears, you may sort all discovered situations by their correlation rank, the Z-score separation in standard deviation units, and other considerations before deciding on the market pair to employ for your next trading opportunity. Exit Strategies-- Once trading pairs have been identified, the same set of market pairs may be examined daily with a "One vs. One" study on each pair chosen and watch market's unfold, view the on-going Z-score reports, and the movement of the market pair each day. Of course, you can and should monitor the progress of each spread trade that you activated by running the "One vs. One" study daily for each market pair that you considered. In my view, one should principally watch the Z-score changes from the starting day of the trade to some narrowing level near zero (0.00) before closing the trade. Take your profits when the Z-score differential retreats to an acceptable level, or your trade is experiencing a loss that goes against your level of tolerable risk. Not every trade will develop into a profit. Diligently protect your capital at all times. Setting Correlation Levels-- When searching for extraordinary opportunities, please be advised that very high correlation levels close to 1.0 from an "All vs. All" search may not necessarily result in profitable trading outcomes. A very high, but rare, correlation level offers little opportunity for tradable differences to occur because highly correlated market pairs very close to +1.0 consistently leave little opportunity for profit. Most personal searches should begin at an absolute correlation level of around 0.98 or less because this would provide a reasonable chance for a market dispersion to result. On the other hand, try to avoid accepting very low correlation coefficients because randomness can always become a factor. Treat the correlation coefficient as a probability of a sought-after event, and expect only what is reasonable. Interpreting Z-scores-- The Z-score parameter range provided from an "All vs. All" study measures the significance of the terminal day dispersion between the market pair members. The Z-score parameter may be reported up to 10 standard deviations and beyond which, of course, is far beyond what a typical normally distributed frequency distribution could possibly reveal. We bring up this matter because some distributional forms are absolutely not of the normal probability density class. However, because this matter may be important to statisticians, we had to make this point. The distributional requirements for markets may not necessarily follow typical traditional statistical concepts. Therefore a wide level statistical dispersion may result in situations when market movement and behavior is not normally distributed. A normal distribution of events brings into play the proverbial bell-shaped curve. This is the typical case, but when Z-scores get much beyond 4.0 the bell shaped curve can give rise to highly peaked distributional forms or very flat or shallow (non-normal) distributional forms. Because of this concept, the Z-score can sometimes reach unusual levels approaching + or - 10 in place of the usual + or - 3 situations that often develop from normally distributional situations. Identifying Spread Trade Pairs-- Following an "All vs. All" study, the user may want to witness the historical statistical movement of a given market pair by consulting the multi-year chart of the proposed market pair. By clicking on the name of one of the markets suggested from among the rather long list of opportunities. You will be provided with a chart of the market pair that extends for the many years requested in the "All vs. All" study. Typically, there will be a chart prepared in blue, another in red, and the Z-score line is presented in green, and occasionally in gray. The spread chart will typically show a red line for the market to be sold, and a blue line for the market to be bought. The green Z-score chart line measures the statistical differential between the pair of proposed markets. This red vs. blue concept adopted by CSI helps the user to avoid mixing the direction of emerging market pairs. The red line always portrays the candidate short sale market, whereas the blue line typically represents the purchase side of the proposed spread trade. Unusual Pairs-- As you become familiar with the process, you may notice that there are occasional opportunities or situation wherein certain correlated market situations one might specifically be advised to sell both markets, or to buy both markets. We bring this up at this time to avoid questions later. This phenomenon sometimes surfaces when there is a phase change for one of the components of the studied pair. We personally recommend users act on such situations with great caution. Balancing Risk-- When a user conducts the correlation studies described herein, he will undoubtedly see situations wherein a commodity is traded off against a stock, or a high priced stock is traded against a low priced stock. The explanatory tables shown below any given proposed market pair carefully advise the user of the respective quantities of each member of the pair such that one can make the tradeoff based upon price, and again based upon volatility of the respective pair members. I prefer using simply the market price approach, but that is only my opinion. The main point I am making here is to keep dollars at risk constant between pair members whether or not you have chosen price or volatility as your trade-off or equality goal. Per-Trade Investment Costs-- Also present in the details below in the One vs. One chart is a table showing, among many other things, the net changes in dollar value for each of the prior ten days. This information is helpful to the user in assessing the day-to-day dollar risk one will have to sustain should the market pair move against you. This assessment is based upon the two items: stock or contract value price or stock or contract dollar volatility. There are many other helpful details to consider in the tables. Knowing the level of risk to which one may be exposed is important for maintaining a balance for your portfolio. Avoiding Coincident Losses-- Another major consideration all traders must take into account is the idea of a balanced portfolio. When launching a given portfolio of markets, one pair at a time, the trader should be absolutely certain that his resulting total mix of markets does not have a mix of market pairs where several markets are jointly correlated. An entry among the "One vs. One", "One vs. All", and "All vs. All" selection area happens to be the "Portfolio" entry. This entry will bring together all contemplated markets chosen for your overall portfolio of trading situations. What the trader should be very cautious about is compiling a portfolio mix whereby coincident losses of several markets can gang up to lose money simultaneously. Suppose your pairing efforts have led you to simultaneously choose the correlated pairs of: market A vs. B, market C vs. D, and market E vs. F. If you enter those six market into the "Portfolio" study, you will want to see how A correlates with , C, D, E, and F, and similarly how B correlates with C, D, E, and F, etc. through all possible pairs. In other words, the trader should ask, "is their significant correlation between unintended pairs in the same portfolio?" If unintended "companions" of the same portfolio are correlated, you may experience coincident losses. The purpose of the "Portfolio" study is to minimize the prospect of coincident loss. Portfolios must be balanced because nothing will push you from the markets more quickly than the act of holding many correlated products, whereby many losses in correlated products can compromise your trading efforts. Look for correlation within pairs, but look for market independence, and avoid heavy correlation levels over perhaps an absolute value of 0.50 between unintended market pairs. Confirm this requirement by consulting the Portfolio study after assembling your matrix of correlated market pairs, and before you begin your trading experience. Tradeable products-- The CSI depth and scope of market coverage includes world commodity contracts, stocks, mutual funds, exchange traded funds, indices, bonds, and just about everything else that trades on a daily frequency. The red arrow system-- In the right margin of the "All" studies, red arrows may appear in the right margin to help the user hasten his or her search for trading opportunities. I especially treasure the down red arrow with a horizontal hat on the arrow. This is an exceptional opportunity for profit because it monitors a change in the up direction of the green line, and is posted only when the Z-score threshold has been reached. The details are disclosed within the site verbiage. Please consider that helpful tool because it will save a great deal of time in identifying excellent opportunities for immediate application. Knowing your markets-- And, Oh yes, don't forget to click on the "face" profile option to learn about nearly every one of the over 100,000 stocks in the CSI database. The time to do this is after you find a promising pair, and before you launch a trade. It is generally mandatory to understand why a pair of markets is positively or negatively correlated. That profile icon will inform you of the salient details of most stocks in the CSI database. Know your markets--Never trade on coincidences! Negative Correlation Opportunities-- Some other interesting concepts worthy of mention will hopefully wrap up this introductory piece. I didn't refer to negatively correlated markets where when one market goes up the other follows suit by moving down. Such situations, although rare, offer great opportunities for trading. I will offer some examples: Copper is a great metal in that it is favored by air-conditioning manufacturers. Trading a company against a key commodity product is often an excellent way to trade. Copper futures traded against a company which manufactures A/C equipment like STD, the manufacturer of the Trane air conditioning system is an interesting choice. Another example might be an airline stock vs. oil futures. How about Starbucks vs. Coffee futures? If you think about it, there may be many negatively correlated situations you can personally discover. 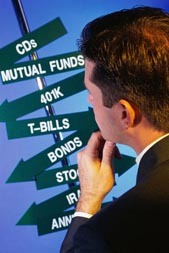 Suggestions for improvement-- I wish our readers great prosperity in their trading pursuits. This article may be expanded as situations develop. Thank you for spending the time to read some of the more exciting characteristics of correlation analysis. I would like to hear from readers who might wish to offer extended views, criticisms, or suggestions for improvement. We can be very responsive and helpful. Call (800)274-4727 or (561)392-8663 to order by phone.